Last May, I took a course at 3rd Ward the title of which I could not resist. Urban Food Production for the Landless is a workshop taught by Brooklyn Homesteader, Meg Paska. The course covered all of the things one can grow indoors in a small urban space, including sprouting beans, starting seeds, making edible pea-shoot terrariums, and – most intriguing – growing mushrooms in coffee grounds. Although I like watching them grow, I’m not much of a sprout eater, but growing young pea shoots is easy and delicious. The mushrooms are on my list to try. While the workshop was fun, I wouldn’t say we are “living off the fat of no land” here in Manhattan. 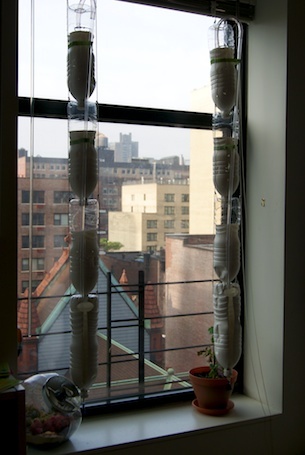 It did, however, give me the momentum to pursue building a Windowfarm, something I’ve been wanting to do since learning about the project created by artist, Britta Riley, in February 2009 and first shown at the Eyebeam Center for Art & Technology. Windowfarms are indoor, hydroponic gardening systems made out of recycled materials – mostly plastic bottles- designed to operate in low-light urban environments. Riley, an artist whose work deals with crowd-sourcing solutions to environmental issues, was inspired to design an accessible way to promote urban food production after reading Michael Pollen’s 2008 New York Times article, “Why Bother?”. Originally, the Windowfarm project consisted of an open source web platform developed by Riley called “Research and Develop it Yourself” that posted instructions on how to build your own kit and created an online forum for early windowfarmers – there are now 22,000 of us online – to share their experiences and innovations on the plans. Unless you’re MacGyver however, the truth is, building a windowfarm is a somewhat complicated process and the plans were intimidating. Until I learned that you could purchase a windowfarm kit: all the parts are included, you just have to put it together. Easy peasy. Except when the kit arrived, I realized it was a little more involved than spending a few minutes hanging it up. So it took me a good, long while to work up to taking all the pieces out of the box. 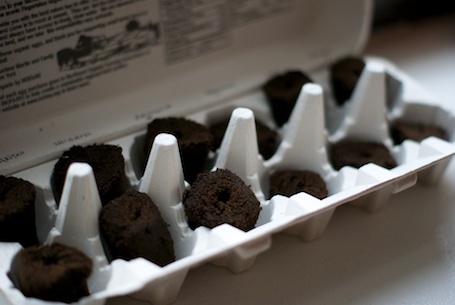 After a few minutes, I planted the seeds in the grow-plugs and placed them in an egg carton to germinate. The first 24 hours were spent – as directed – in a dark closet. After that, I set them on the windowsill where my windowfarm is installed. After the second day, I was thrilled to see the arugula sprouting! I felt awesome. Like maybe this will actually work. But it was only the arugula. Nothing else. And it didn’t last long, I think the windowsill environment was too cold for the little seedlings and the next day they were dead. I’m thinking this indoor agriculture endeavor has a higher learning curve than I previously imagined. But I still have seeds, and I still have grow-plugs and now I have a new indoor grow-light system to help my next batch of seedlings along. I don’t want to be deterred, because I think this is one of the coolest ideas to come along in the past decade and I would love to see it catch on. In the meantime, WindowFarm design has evolved to a new level and has a Kickstarter Campaign for their groovy new high-design models that will make it even easier and more beautiful to install in your apartment. If you support their cause in the next 4 days, you can have one of your very own! Click on the image below and they’ll tell you all about it. 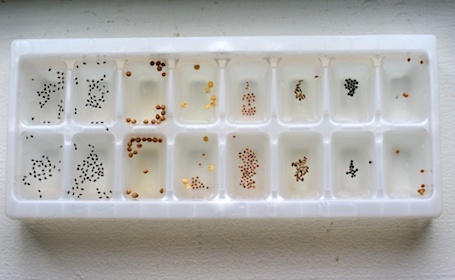 In the meantime, I am starting my second round of seedlings today. 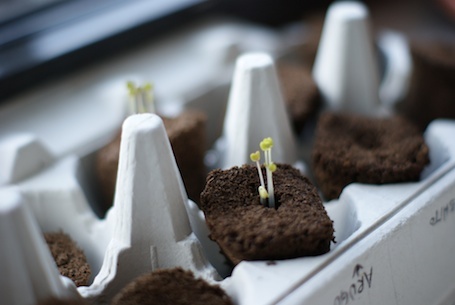 This entry was posted on December 4, 2011, 8:22 am and is filed under garden, Green, home, Urban Homestead, Windowfarm. You can follow any responses to this entry through RSS 2.0. You can leave a response, or trackback from your own site. Were you using 10% Hydrogen Peroxide or 1:10 of a 3% solution? I would think that 10% peroxide would be too strong for seeds whereas a 0.3% solution would be good but that is just a guess on my part. I was eyeballing it. I poured in what looked to be 1/10th Hydrogen Peroxide and then filled the rest with water. Guess I should be more scientific next time. Thanks for the heads up! But were you diluting 3% peroxide when you did it or 10% peroxide? If you were diluting 3% peroxide at a 1:10 ratio that should be weak enough not to harm the seeds. But, if you were using 10% peroxide, then you might have an issue. It’s a .3% solution. I think my issue was temperature fluctuation in the windowsill… So now I have a grow-light and am trying again this week. Wish me luck.